Our company is fully licensed and insured in the state of California. We service Laguna Beach, Laguna Niguel, Mission Viejo, Lake Forest, Cota De Caza, & Rancho Santa and have highly trained and experienced staff ready to address your problem immediately. Give us a call at 310-421-2554, and we will listen to your animal problem, determine the most reasonable course of action, quote a price for services, and schedule an appointment for same-day or next-day service. We answer our phones 24/7, so don't hesitate to call us at any time! We pride ourselves on the quality of our work. We do not perform pest control services in Laguna Beach, Laguna Niguel, Mission Viejo, Lake Forest, Cota De Caza, & Rancho Santa, and we do not exterminate or poison wildlife. We are professional wildlife control experts, and we employ humane and intelligent means for permanently solving wildlife conflicts. Trapping is an art that requires a lot of experience (not to mention the proper training, equipment, and licensing). 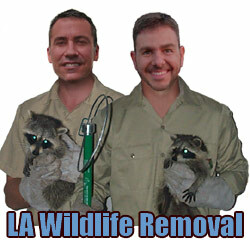 We truly believe that we are the best wildlife operators in Laguna Beach, Laguna Niguel, Mission Viejo, Lake Forest, Cota De Caza, & Rancho Santa, and we back up our work with a guarantee.